Wolverines Rebirth is representing the Saiph Protectorate in the Chaos March and we had some nice fights already. "We thought the Clans were bad; the Chaos March is worse. Don't look at me like I'm crazy for saying that- I've been there. I know. With the Clans, you know who your enemies are. You never know in the Chaos March. The enemy could be the one your employer says it is, or the folks you're supposed to be protecting. Or even the guy whose contract you just signed. You never know." - From an interview with Cal Ecchardt, former lance commander of the Cold Steel Cowboys, a now-defunct mercenary unit, Outreach channel 2, March 3058. Welcome to the Chaos March. This is a weekly event hosted by the MWLL community, for the MWLL community. It features a persistent campaign spanning the whole canonic Chaos March section of space - a place where mayhem and destruction are just another day's business. Four factions face off against each other on the countless maps MWLL has to offer in engagements meant to recreate the spirit of Battletech, to be experienced in first person. 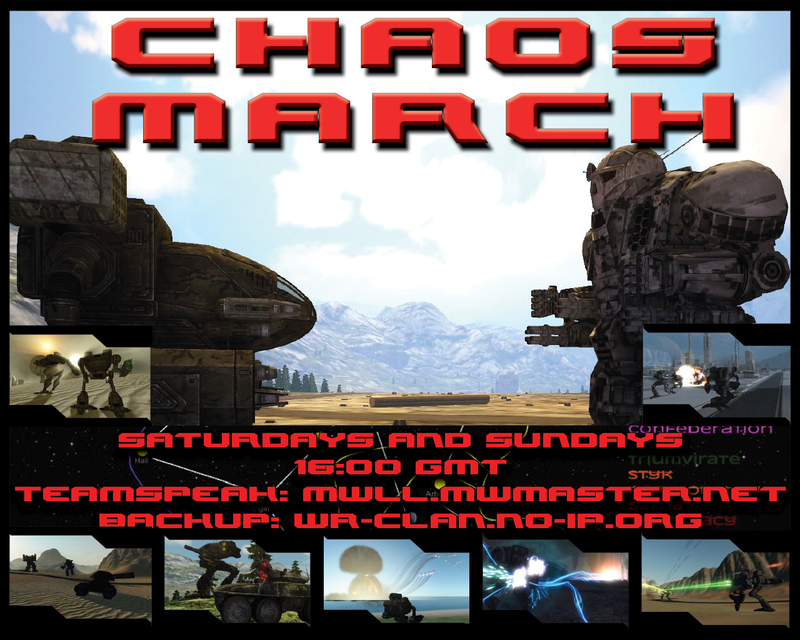 As the pinnacle of the previous community meta games held by the MWLL community in previous years, Chaos March 2.0 is launching this weekend on Saturday, 31st October, 16:00 GMT, leading into two more game nights on Sunday and Monday. 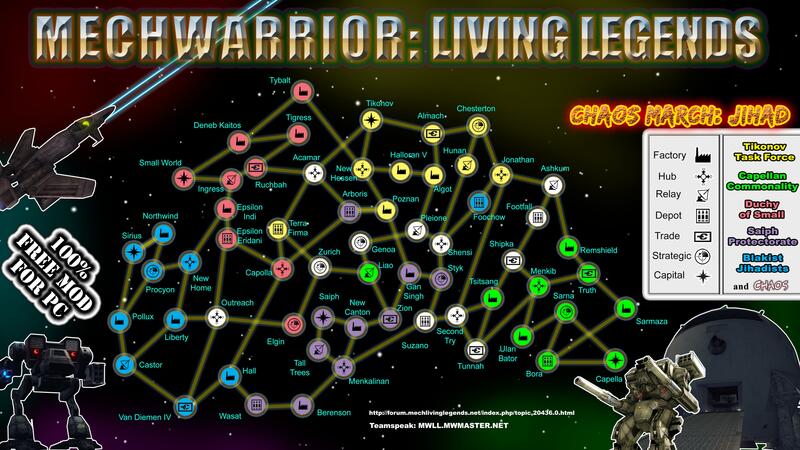 The center of the new Chaos March is the Star Map (https://i.imgur.com/0oDxLAE.jpg), the base for a persistent campaign, tracking each faction's fighting assets, and progress amongst the stars. Every planet captured matters, be it for industrial manufacturing, c-bills gained from trade worlds, or insight into the enemy fleet by helping your spies gain control of strategically important worlds. Get on to our game servers or Teamspeak 3 Server under mwll.mwmaster.net any Saturday or Sunday between 16:00 GMT – 0:00 GMT. Teamspeak 3 is a free program that is required so you can hear your team's coordination, a mic is helpful but not at all required. If you have any trouble installing the game or getting it to work, join us any time on our TS3 Server mwll.mwmaster.net, we're happy to help you out! The lines have been drawn. The fleets are in place. The attack will commence on Saturday, 31st October, 1600 GMT/1200 EST. - Will you be a forgotten casualty, or a living legend? Burner, do you know what happend if you divide 275 with 5 ? Hmm, 5 Black Lanner I guess. Oh, we are getting also a Longtom ?